Fluffy pterosaurs offer vibrant insight into Mesozoic evolution. Filament structures on the head and shoulder of a pterosaur specimen.Credit: Z. Yang et al./Nature Ecol. Evol. Pterosaurs are the first known vertebrate group to have evolved powered flight — preceding birds and bats by many millions of years. Ranging from the size of small birds to that of small planes, pterosaurs lived alongside the dinosaurs and went extinct at the same time. Many things about these creatures remain mysterious, not least their origin — the earliest pterosaur fossils found so far seem to have been fully capable of flight, and there is no confirmed transitional fossil to show from which reptilian group they emerged. This is different from, say, birds. Revelations over the past two decades that bird-like feathers were present on dinosaurs — ground dwelling and with the flight capability of a sack of spanners — have illuminated our understanding of the evolution of birds and their characteristic structures. That the bodies of at least some pterosaurs were clothed with a kind of fuzz has been known (or at least suspected) since the 1830s, but this fluffiness became a focus of study only after the description of the exceptionally hirsute Kazakh pterosaur Sordes pilosus in 1971. Pterosaur fluff, comprised of what are technically known as ‘pycnofibres’, is structurally different from mammalian fur or hair. Each pycnofibre is a short, simple filament with a canal running down the centre, and is much more superficially attached than the deeply rooted hairs of mammals. Pycnofibres have been observed on the heads, limbs and bodies of several pterosaur fossils. Ironically, given that they could fly, discussion of feathers and feather-like structures has tended to ignore pterosaurs. Instead it has focused on non-avian dinosaurs, which couldn’t. As a result, the relationship — if any — between pterosaur pycnofibres and dinosaur feathers has been obscure. No longer. 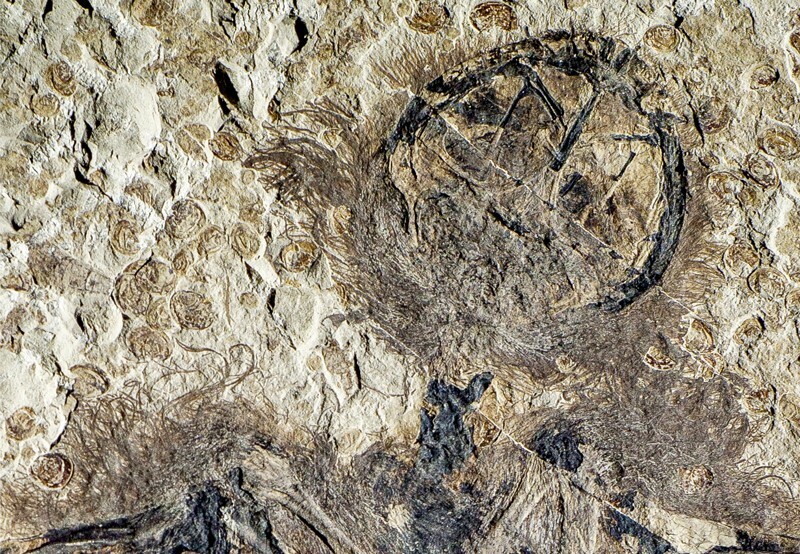 A paper this week in Nature Ecology and Evolution shows that some pycnofibres, far from being simple monofilaments, had branching or brush-like structures — just like the feathers found on birds and their closest dinosaur relatives (Z. Yang et al. Nature Ecol. Evol. 3, 24–30; 2019). The study suggests, therefore, that pycnofibres could share an evolutionary origin with dinosaur and bird feathers. And the common ancestor of birds, dinosaurs and pterosaurs might also have been able to produce such pycnofibre structures. The study’s evidence comes from fossils of two sparrow-sized pterosaurs between 160 million and 165 million years old (a shade earlier than the earliest known bird, Archaeopteryx, which is around 150 million years old), from the Jurassic period of China. The pterosaurs have four distinct kinds of pycnofibre: the regular monofilaments seen in other pterosaurs; a type with a brush at the distal ends; a variety in which brush-like filaments sprout from the middle of the main fibre; and a fourth, in which several fibres meander from a common root. Structures corresponding to all four types of pycnofibre have been found associated with various dinosaurs, underlining the case that pterosaurs are indeed related to dinosaurs. Importantly, each kind of fibre is not distributed randomly on the bodies of the two pterosaurs. The simple monofilament form is found all over the body; the brush-like form on particular regions of the head, limbs and tail; and the curious form with sprouting filaments is restricted to the head. The fourth form, which closely resembles the down of bird chicks, is found on the wing membranes. This distinct distribution indicates that each type had a biological function, and that one kind of filament was not simply the decayed product of another. What were these functions? Pycnofibres of the first and second type might have provided insulation and streamlined the body shape to minimize aerodynamic drag, as feathers do in birds and fur does in bats. The sprouting type on the head might have functioned similarly to the sensory bristles found on the heads of modern birds. The downy, fourth kind of fibre might have helped to keep the wings warm, as it’s known that feathers with this structure are much more efficient at trapping warm air than is mammalian hair. Moreover, the pycnofibres contain remnants of melanosomes — organelles that are typically found in feathers, feather-like structures and mammalian hairs, and that help to lend these structures their distinctive colours. When applied to the pterosaur fuzz, a technique called Fourier-transform infrared spectroscopy produces the same spectra as those found in birds both ancient and modern, as well as red (but not black) human hair. For the first time, we can visualize pterosaurs with a touch of colour, as we can fossil birds, dinosaurs and even dinosaur eggs. Flying alongside the earliest birds and even some very early flying mammals, pterosaurs must have made the skies of the Mesozoic Era a riot of life and colour.